Medical expert Dr Zoe Williams from ITV’s ‘This Morning’ spent an afternoon inspiring female students at The Lower Academy. 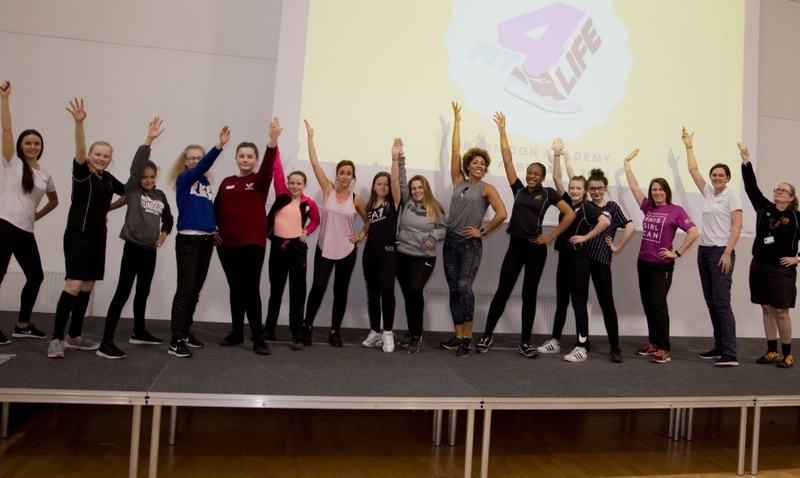 The event marked the launch of the ‘This Girl Can Essex’ project, a 20 week programme delivered by ‘Active Essex’ in partnership with ‘Fit4Life’ and ‘Sport for Confidence’. Dr Williams, famously known as Amazon in the Sky TV show Gladiators, spoke to the girls about her experiences and how they have the ability to achieve anything they set their minds to. The motivational speech was followed by the girls taking the opportunity to work with and share ideas with Dr Williams and the project team, with a focus on breaking barriers and gaining confidence through sport. The last session saw everyone take part in fun and energetic boxing exercises. Lower Academy PE teacher Ms Rallings said; “It was fantastic to see the girls’ reaction to meeting Dr Zoe Williams. They went from being surprised to being amazed about her accomplishments. Seeing the girls smiling, laughing and interacting with each other in conversations and activities highlighted how important this project is to them. I would like to thank Dr Zoe for her inspirational visit and look forward to her coming back to see the girls’ towards the end of the project”. Speaking after the event Dr Williams enthused; “I was absolutely thrilled to attend the launch event of the ‘This Girl Can Essex’ project and want to thank the 12 amazing girls who took part in the session and who have signed up to the 20 week programme. We can’t wait to hear how you grow and progress over the next 8 weeks until we see you again. It was really incredible to see just how much potential was revealed from within these girls, which is precisely what Fit4Life is all about”. Dawn Warner, from the Fit4Life team added “It was a real delight to watch how the girls grew in confidence, even in the short time that we were together”. “I learned that you can achieve anything you want, it doesn’t matter which background you’re from”. Fit4Life is a Community Interest Company (CIC) founded by Dr Zoe Williams. Fit4Life’s mission is to make a difference within the communities of highest areas of deprivation by using physical activity as a vehicle to change lives for the better. Our aim is to increase self-esteem, raise life aspirations and confidence to inspire young people through physical activity programmes. We want more young people to be told ‘Yes You Can’ to help set them on a path to reach their fullest potential. Fit4Life works in partnership with specialist organisations to improve the health and wellbeing of young people by increasing engagement with physical activity opportunities. The overarching key component and principle of our approach is that the young people co-create the programmes to ensure their programme feels ‘personally owned’. Our message to all young people Yes You Can! Click here for photos of the launch event.